UCL's Kathleen Lonsdale Building, home to UCL Earth Sciences and groups from Chemistry, Astrophysics, and Mathematics, was re-opened by Sir David Attenborough on Tuesday 17 April following renovation. 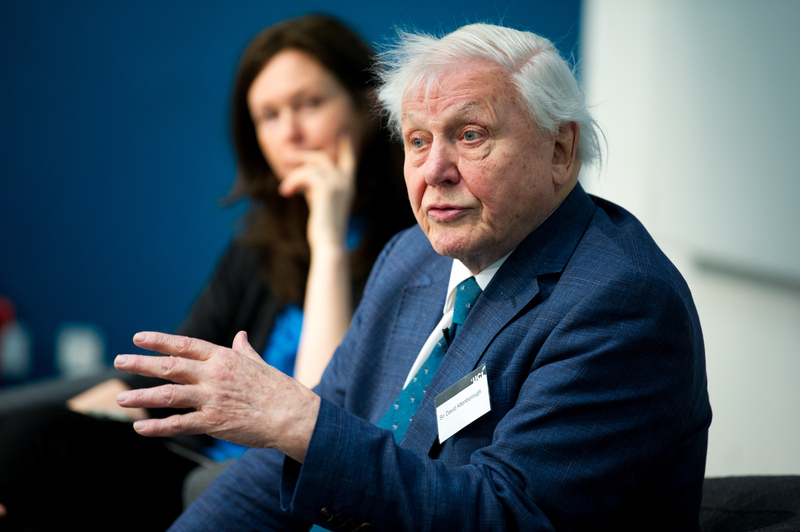 UCL's Kathleen Lonsdale Building, home to UCL Earth Sciences and groups from Chemistry, Astrophysics, and Mathematics, was re-opened by Sir David Attenborough on Tuesday 17 April following a £27.5 million refurbishment. As part of the celebrations, scientists Professor Paul Bown and Dr Jeremy Young named a newly discovered ocean plankton species in honour of the BBC's Blue Planet series production team. The Kathleen Lonsdale Building was constructed in 1915 as the first purpose-built Chemistry building for UCL. Over the years, it has been adapted to suit different UCL departments, predominantly Earth Sciences, but has also housed groups from across UCL Mathematical & Physical Sciences. Kathleen Lonsdale was a scientist, Quaker and pacifist, whose ground breaking research in crystallography was conducted at UCL under the shadow of World War II. She was the first woman to be elected a Fellow of the Royal Society when, in 1945, it was decided that the term 'Fellow' could encompass women. Furthermore, she was the first female President of the British Association. Hosted by Professor Lars Stixrude (Head of UCL Earth Sciences) and Professor Ivan Parkin (Dean of UCL Mathematical & Physical Sciences), the re-opening ceremony: 'An audience with Sir David Attenborough' celebrated the outstanding completion of the renovation of the Kathleen Lonsdale Building by UCL Estates as part of Transforming UCL. The day began with a morning reception in the Rock Room, which showcases the highlights of the department's rock collection, including rocks, minerals, and fossils, some of which have been with UCL since 1855. This was followed by an arm-chair style discussion with Sir David Attenborough facilitated by Professor Lucie Green from UCL Space & Climate Physics and followed by a Q&A from the audience. The audience was extremely engaged with what Sir David had to say and asked thought provoking-questions on a range of topics from the sustainability of the meat industry, to the most fun moment of his illustrious documentary career. During the talk, Sir David was presented with a ceramic sculpture of the newly discovered species of ocean plankton named Syracosphaera azureaplaneta in honour of the BBC's Blue Planet series. In the afternoon, Sir David met with the staff and students working in the different departments of the Kathleen Lonsdale Building. They showcased activities, discoveries, and research - from machine learning to earthquake geology- in their newly renovated surroundings. The day ended with the unveiling of a new plaque by Sir David, followed by refreshments with staff, alumni, and students. "The faculty and UCL Earth Sciences warmly thanks Sir David for relaunching the KLB building and the Earth Sciences department. Sir David is very much a geologist at heart and was able to keep the academics on their toes by asking some very deep technical questions. We also thank him for his warmth, generosity and enthusiasm. The students and staff were so thrilled that he came along - to most he is our scientific hero, and one of the reasons we study natural sciences." Said Professor Ivan Parkin.